Hayling Island Labs - After Hours: Bargain! I can't help showing off a bargain from that auction site again. 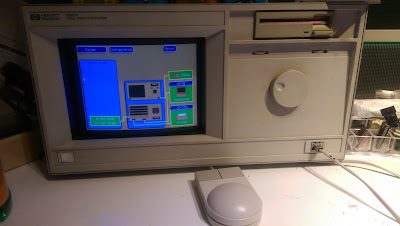 This time I found an HP 16500A logic analyser for very few pennies. It didn't have any software with it, but eventually I found that on a site linked from Agilent. 720k diskettes? Pah! a mere bagatelle. 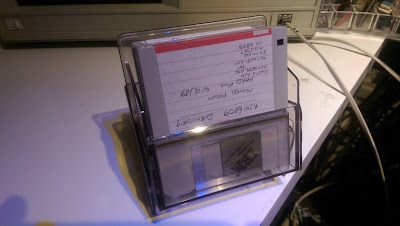 Remember when we used to get boxes of diskettes in perspex holders? I do, and I have a couple of boxes still. A machine that can run DOS? Well I have an old Toshiba Satellite 110CT, which boots into Windows 98. Close enough. And here it is. Unfortunately the little pigtail cable for the Xircom ethernet PCMCIA is missing. I have two other PCMCIA network adapters, but they are both cardbus and won't fit. But we do have a USB diskette drive for the Linux machine, so I can download the software and move it over with diskettes! 3.9MB at 720K is five bites. Actually because of the way the files are split up, it takes seven. And THEN, we get to the point of writing the diskettes with the correct format (77 tracks, not 80, 1024 byte sectors, no interleave). Wow. Don't diskettes take a huge amount of time to write and read?